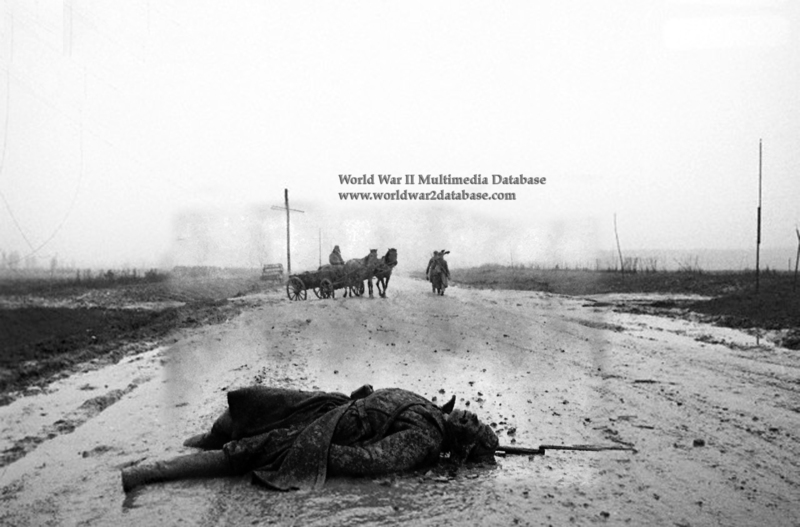 Dmitri Baltermants's photograph "On the Road to War." Taken during the Fall of 1941, it shows one of the many Red Army soldiers killed during the first six months of fighting. Baltermants took the photo on the Smolensk Front sometime after the end of the campaign. Shortly after Soviet Premier Josef Stalin called for the entire nation to resist the Germans on July 3, 1941, Army Group Center was approaching Smolensk, the traditional Russian gateway to Moscow. The Germans encountered increasing resistance. The Soviets blew bridges and laid mines to stop the armored advance. The German 2nd and 3rd Panzer Armies, outstripping their accompanying infantry, paused to regroup. This allowed STAVKA, the Soviet Army Command, to reinforce Smolensk with six Armies. However, many of these units were not at full strength, lacked training and modern equipment, and had never operated together as a Front (the Soviet equivalent of an Army Group). On July 6-9, 1941, some 700 tanks of the Soviet 20th Army's 5th and 7th Mechanized Corps were destroyed by superior German air forces. Smolensk itself fell on July 16. On July 26, the German tanks completed the encirclement of 300,000 Soviet troops. 100,000 were captured; the rest infiltrated back to Soviet-held territory. Smolensk was liberated on September 25, 1943. The city was mostly destroyed. Smolensk was designated a Hero City of the Soviet Union in 1985. Like most of the Soviet photographers' work that showed death or destruction, Baltermants's photo was suppressed by the Soviet censors until after World War II.